Little did I know back then what a momentous check this one would be: that 11 years later, Dropbox would be the first Y Combinator company to go public. I wish I could say that Paul, Robert, Trevor and I knew this would be one of the big ones when we interviewed Drew and Arash on April 21, 2007. They were the first interview of the day, at 8:30am. Though it was a long time ago, I remember we all agreed that they seemed good, and it was an easy decision to fund them. Trevor had already looked at the software and was impressed by it. We’d met Drew the year before. He’d been Adam Smith’s big brother in MIT’s Phi Delta Theta fraternity. Adam was a founder of Xobni, which was in the Summer ’06 batch, and he’d brought Drew with him as a guest to a YC dinner. We also met Drew at YC’s Startup School in California in March 2007. He came to the afterparty at our house and showed us an early prototype of Dropbox. I remember him being likeable, earnest, and very energetic. When Drew applied to YC, he applied as a single founder. After we invited him to interviews, Paul sent him an email suggesting he’d be better off with a cofounder. By interviews, a few weeks later, he’d found Arash. That worked out well. Drew and Arash spent the summer of 2007 writing code. In those days there were a lot of file storage and syncing services, but none of them worked very well. The Dropbox founders were determined from the very beginning to win by making a product that was better than anything else. They used their batchmates, and us, as their guinea pigs. We had Demo Day at our Cambridge office in August. For the first few years, we remembered each Demo Day by the disaster that happened during it. This was the Demo Day when our air conditioning system broke during a heat wave. We had to rent portable air conditioners, which took up huge amounts of space and did little to cool off our little oven of a building. Nevertheless, Drew gave an excellent pitch. It’s not easy to make file syncing look exciting, but Paul thought of a way: he suggested Drew delete his Demo Day presentation in the middle of giving it, and then recover it from Dropbox and keep going. Usually we don’t suggest gags like this during pitches, but this one made people pay attention. I think even Drew was not 100% sure it would work. Drew Presenting at Demo Day in Mountain View. Arash driving the slides. 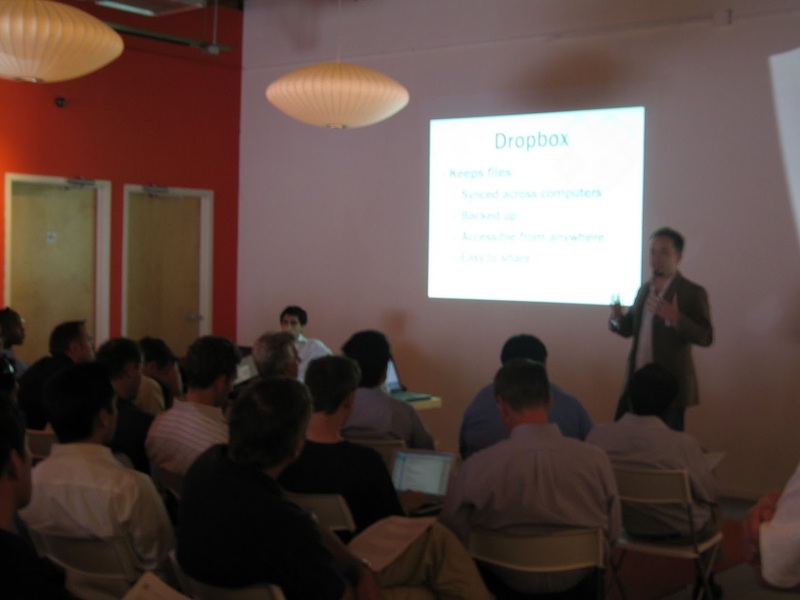 Dropbox impressed investors in Boston. It just didn’t impress them enough to write a check. We used to do one Demo Day in Boston in the summer, then fly everyone out to Silicon Valley to do another there a week later. So Boston investors had an entire week before any Silicon Valley investors saw Dropbox, and not one of them made a move. I think the party line was that “the space was too crowded.” Drew and Arash presented in our Mountain View Office on August 16, raised money from Sequoia, and moved to San Francisco. Year after year, I’ve seen Drew and Arash grow Dropbox into a bigger and more successful company. And I’ve become prouder and prouder of them as they continue to refine their original vision. Today is a big milestone for YC. When we launched 13 years ago, we never imagined that a company that we’d funded would one day go public. We are so proud of Drew and Arash and the Dropbox team!